This February 2018 photo shows the most recent proposed route for the PennEast pipeline through Albertine Anthony's farm in Palmerton, Pennsylvania. The route cuts through a triangle of unfarmed wetland that is the source of Anthony's home water supply. The Delaware River Basin Commission asked a federal regulator to prevent PennEast cutting trees in the basin before it issues any approval for its controversial natural gas pipeline project in Pennsylvania and New Jersey, according to documents released on Wednesday. But its request was not considered by the Federal Energy Regulatory Commission because it was not sent through the proper channels, a FERC spokeswoman said. 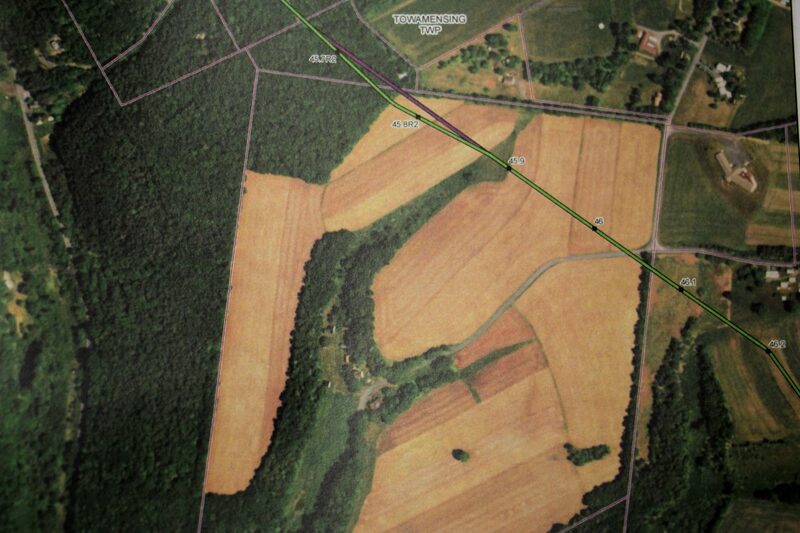 The DRBC confirmed it had asked FERC to block early tree clearing by PennEast but had not received a reply. It said later that it will resubmit the letter.